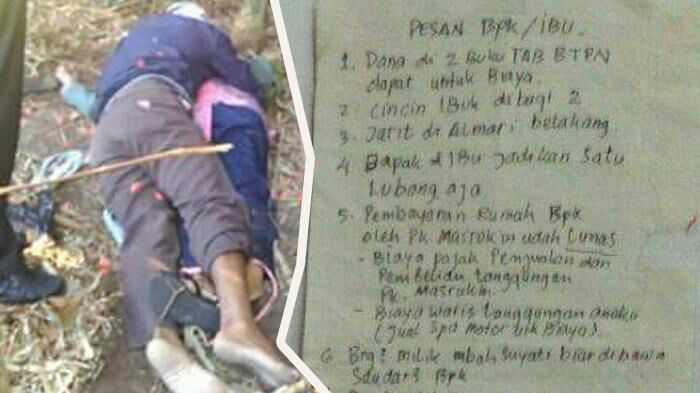 11 August 2016, a couple of poor peasants named Suhartono and Sulistiorini were found dead in a paddy field of Butuh Village, Keras Subdistrict, Kediri, Indonesia. They both committed suicide by drinking poison due to the unbearable amounted debts. Both were devoted Muslims, but the snare of the loan shark did not demand their faith. Their death need no certification from Indonesian Cleric Council (MUI), or a cheek-in-tongue discourse by the Islamic Liberal Network (JIL), or mourning youths who often claim themselves as ‘Muslim progressives’. Their death would only bear witness to the need of the proletariat Muslim peasant couple for money to pay their debts and save their lives from the hunt of loan shark. Did their act of Islam – and the act of Islam by people around them – able to save them? No. the problem of our Islamic faith is classic: our act of Islam is yet to actually exist as a saviour to those of the oppressed. Let us point it directly, as a critique and auto-critique: our Islamic faith is a bourgeois faith. One that perpetuates selfishness and personal desire, diminishes solidarity, increases the pride of material luxury over social inequality. This is primarily not a moral issue. It is first and foremost a material issue. Our Islamic faith is constructed through the hegemony of an ideology of political economy conception, in which it shifts the attention of Islam from material issues to ideational issues, from the attention toward the material-concrete conditions to the theology and truth-claiming discourses. This ideology hegemony is sustained by two things: Islamic liberalism political economy that lies together with the neo-classical political economy of capitalism. How does the critique toward these two political economies possible? What are the relations between the death of the two peasants with the thought of Ulil Abshar-Abdalla or those Muslim intellectuals linger in Freedom Institute, with a stock market at Jakarta Stock Exchange (Indonesia’s ‘Wallstreet’), and even with the preaching of Aa Gym and Ary Ginandjar’s “ESQ” Islamic-business motivation? The intertwine is invisible today because that is exactly how the ideology operates: it obscures the material conditions as the basis of material contradictions, a locus of virulent forces where political economy operates, by providing a stage for the chess play of discourses overarching the conflict that occurs among those forces. The diminishing of empathy to the fate of the poor peasants is a kind of social ethos brought by the growing individualism, selfishness, and greed rampant in our society. This social ethos is nurtured by political economy ideology in which it provides space for the individualism to flourish – a political economy ideology of market oriented that transform society as its economic competition arena. This political economy ideology is manifested and gain its institutional support through the presence of political economy institutions guarantee to maintain the competition and the flow of capital in order to create an abundance of accumulation: corporations, financial markets, banks, stock exchange, etc. There is a close relation between the three, and when one of the elements is proven to suffer a crisis, the other elements would be affected and would undergo fundamental shifts. The global financial crisis over the last several years have torn down the political economy institutions, especially financial markets and banks, that pushed the market back into the state’s protection in order to save their falling capital assets. The laissez-faire doctrine – “let the market operates free” – collapsed, proving that the market cannot detach itself from the control of the state politics rely on the real sector (non-financial). When these political economy institutions suffered more of its lack of confidence, the lower it is the confidence of the political economy ideology behind it: liberalism, as an ideology, will fall into crisis. The discourses of liberalism that teach individualistic of political economy freedom has receded in the midst of people’s enthusiasm for a new solidarity social bond, based on community or social organisation. In turn, new social ethos seeds are emerging, shifting individualism and put individualism irrelevant: the social ethos with an effort to reattach social bonds torn apart by capitalistic life style that idolise the fulfillment of individual desires. The mystification and illusion are also infecting the growing Islamic political economy in Indonesia. The supra-structural condition (ideological) from today’s Islamic political economy is that Islam and capitalism are believed to be compatible and able to walk hand-in-hand in creating the dream of Indonesian society for justice and welfare. This political economy conception have undergone two phases of development: first, in the early 2000s through Islamic liberalism; and second, 2005 backward through the development of Sharia (capitalist) economy. The Muslim liberal groups in Indonesia at the beginning did not put their attention on political economy. They talked more on the freedom doctrines in Islam, pluralism and interreligious issues. They renounced for a reform in Islam thought without steal a glance of political economy sphere, but their support to the issue of the rise of fuel price and affiliation to the funding from liberals in United State has shown their political economy tendency. Then came the moment of intersection between these liberal Muslim groups with the secular pro-corporation liberal groups that had served as the economic architect of the New Order regime in 1980s (“Berkeley’s Mafia”). They both rely on laissez-faire, a market supremacy above state and society (through deregulation, privatisation, banking financialisation, etc.). Ulil, in his article, proposes a discourse that Islam refuses market intervention by the state. These political economy discourses are not so focused and systematic, but their alignment is clear: a good Islam is Islam that is generous to the capitalists. A good Islam, according to them, is a competitive Islam, like “market”, with its invisible hands. It doesn’t matter if the market serve an arena to prey each other, for the Muslim liberals, “market” is an ideal condition from the political economy institutions guarantee the freedom of each individual. It is elitist in its nature that the discourse does not gain much influence, but nevertheless is supported by other direction through sharia economy in demand by Muslim entrepreneurs. The mission of the new economic flow is to islamicise practices of transactions and consumptions of Muslims that is yet detach themselves from riba (interest rate) practices and verified its halal (religiously allowed). Riba is part of the existing banking institution, so the mission of this sharia economy is to islamicise the banks, along with the ‘sharia principles’. We witness a phenomenon of ‘islamisation’ of capitalism in this phase, such as the development of capitalism that crossed its path with the Protestant Ethic in Max Weber analysis. The financial-banking capitalism is a legacy from classical capitalism, fundamentally transformed by an Islamic discourse into a new economic conception with ‘sharia’ label. This political economy characteristic is basically remains liberalistic, only with a seasoning of moderate and religious nuance. This sharia (capitalist) economy fails to save the lives of the poor peasants. Our point of departure is from the two major problems of Muslims in which the current hegemonic political economy ideology, liberalism and liberalistic ‘Islamic economy’ fail to address: (1) significant increase of Gini coefficient (income inequality measure) along with the widespread of economic freedom, (2) risen exploitation and destruction of natural resources with its dire ecological and social effects. In front of these two issues, Muslim liberal economists and architects of ‘sharia economy’ sealed their lips. How can we explain that only 1 percent of Indonesian population own wealth of the rest 40 percent? (BAZNAS data), and that the development of Islamic economy so far has failed to change the structural inequality, hence perpetuate it? This means there is something fallacious with the existing practices of Islamic political economy. Instead eradicating the structural gap, Islamic economy plays as the backbone of a capitalistic, corporative, and oligarchic national economy. Instead of promising to liberate people from the constraints of the existing economy, Islamic economy turns out pushing them with new economic burdens: continually increasing cost of Islamic education (including in pesantren or Islamic traditional schools), the choking prices of agricultural and plantation rents for farmers and peasants, fluctuation figures of Indonesian Muslims abroad without any safety net or security guarantee. There is an interesting phenomena: several Muslim entrepreneurs open their service for migrant workers (TKI) recruitment. Their ‘piety’ in business is increased concurrent with their exploitation over the lives and sweats of others. What a typical Indonesian Islam ‘social piety’! This gap problem disclose one thing: Islamic political economy today consistently orientates toward class hierarchy (elite-middle class-lower class). Islamic political economy pushed the Muslim middle class because it is believed that the development of a strong Islamic entrepreneurs will bring a broader effect in people’s welfare. What is overlooked from this political economy observation is the strengthening of the middle class would increase exploitation and pressure against the lower class, because the characteristic of our middle class has never been detached from its feudalistic and elitist traits, as well as anti-poor people. The exploitation and the destruction of natural resources cannot be prevented by the existing Islamic political economy. Data on this destruction is massive. We know that capitalism is inextricable to nature since nature is considered a capital to utilise and exploit. More than 70 percent of Indonesia’s abundance in natural resources is privatised through corruptive and exploitative concessions. However, the existing Islamic political economy is incapable to propose any solutions, instead it supports the continuing of exploitation and destruction of natural resources. Numerous Muslim entrepreneurs own business in mining and forestry sector. Despite ravaging the nature, they remain portraying themselves as a pious Muslim (the case of Sandiaga Uno). Further facts expose the institution of Islamic political economy, sharia banking, is actively involving exploitation of natural resources and infrastructure business prone to agrarian conflict. In 2009, sharia banking funded the mining business as much as IDR 1.9 trillion and infrastructure business for IDR 3.648 trillion. These numbers will slowly rise. The question is, why there is an incongruity between the aims of Islamic political economy and people’s condition which they claim to elevate and change? 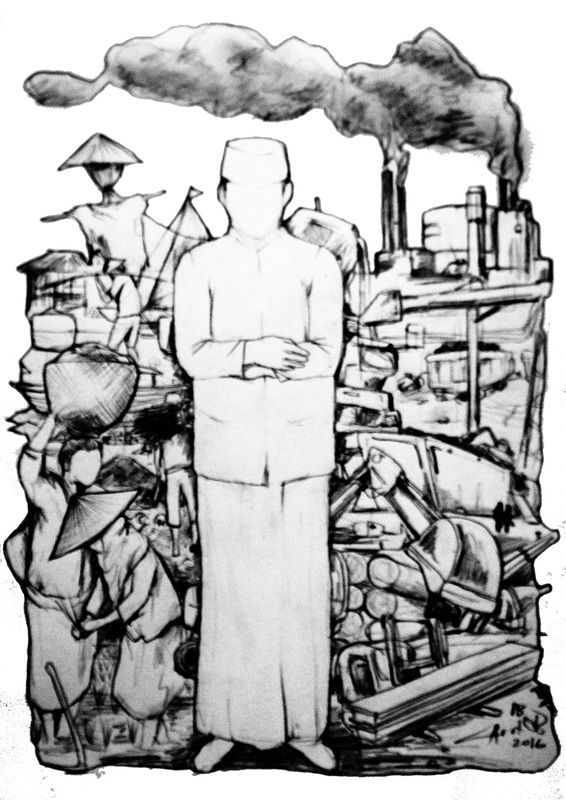 The refutation against Islamic liberal political economy that justifies neoliberal capitalism as the best economic form can be argued through exposing capitalism as an alien form for the life of Muslims in Indonesia, who is grounded by communalistic, semi-socialistic and family patterns (anthropological argument). Neoliberal capitalism is also an alien to the values of Islamic economy that condemns capital accumulation (takatsur), a critique puts forward by ‘sharia economists’, so it is imperative to have a new alternative to economic discipline against neo-classic capitalist political economy. Nonetheless, ‘sharia economy’ as an alternative toward neo-classic capitalist political economy is also under the shadow of neo-classical political economy, thus sub-systematically still thereunder capitalism. This failure is due to the intrinsic factor within ‘sharia economy’ that treads immanently with political economy of neo-classic capitalism, its idealist characteristic. This idealism is located in the immaterial conception, in which political economy is based on the ideal-moral instead of material conditions. The ideal-moral on ‘people’s welfare’ over material conditions is perceived as enabling factor for welfare. In institutional practice, this notion is translated as the concern of ‘sharia economy’ toward distribution and consumption of Muslims, with little attention to the sphere of production, where work and the material conditions for work is overridden while this is exactly the locus of struggle and exploitation of the people perpetrated in a formidable account. This sphere of production, a working sphere and the material condition of work, is ignored, so the hustle of ‘sharia economy’ is rounded in distribution sector (only to be reduced to financial distribution and banking credit sector), transaction, and consumption. The political economy axis in this conception is buy and sell (al-bay’); where economy is perceived to be centred on the act of buy and sell to generate profit. Hence, the problem of injustice, is understood only in the frame of unequal profit distribution. In the words of an Islamic political economy scholar, Muhammad Baqir al-Shadr: “Human injustice manifest itself in economy as a bad distribution”. This kind of thought will justify the practice of credit distribution, which instead of creating prosperity, it will widening the gap due to the unpaid debt. The infaq and sodaqoh distribution incapable of overcoming gap has become the event for philanthropy of the entrepreneurs to inflate their piggy bank and social prestige. The absence of attention toward sphere of production as a sphere where commodities and the work produced and processed serves a fata morgana illusion to Islamic political economy that the commodities are present by itself, as if they are not borne out of dispossession of the labour work, exploitation over land and other sources of life; as if the commodities presented by itself to trade and consume. What is halal (permitted in Islam) to trade and consume (in the distribution and consume) has never been investigated into its production sphere; is it true that this product produced without dispossessing the rights of the labours? That is why the fiqh (Islamic jurisprudence) of production, regulations of production in Islamic law (fiqh al-intaj), cannot be found in the Islamic political economy literature. This is due, by and large, to the absence of ‘work/labour’ category in Islamic political economy. Islamic political economy is perceived to be distinctive from the context of contemporary capitalism. We can easily find this in Islamic economy academic texts in universities. As if ‘Islamic economy’ emerges without intersection with capitalism as a mode of production from the historical trajectory of mankind. ‘Islamic economy’ is presumed as universal in presence, ready-to-use manner. The typical exemplary of this academic, or psedo-academic, discourse with methodological fallacy, is Afzalurrahman’s book, Muhammad as a Merchant, in which he justifies that Prophet Muhammad is a successful capitalist. Further, if we consider his production base, Prophet Muhammad is a worker with no possession of his own capital. It gives an illusion that ‘Islamic economy’ since the beginning as in line with the current form of political economy. By dismissing the capitalism context, capitalism is deemed as universal, entails the notion that Islamic economy has always been capitalistic since fourteen centuries ago, while we know that capitalism entrenched in the structure of Islamic society since the colonial era. What is problematic from the distinction between Islamic political economy and today’s capitalism context is its epistemological effect. Uncritically, Islamic political economy adopted almost entirely the glossary of neo-classical economy. The infidelity between capitalism mind set and Islamic economy perfectly takes place. Islamic political economy is considered as a reaction to modern capitalism (20th century), but missed from today’s neoliberal capitalism context. It can be traced from the figure like M. Dawam Rahardjo and other economists who perceive Islamic political economy as the alternative third way to Capitalism and Socialism-Communism. The trauma of Soviet’s Stalinism downfall – which was more as a form of statism rather than an authentic communism – has overshadow this political economy conception. Thus, Islamic political economy is seen as antithesis to Socialism-Communism, but then Islamic political economy must adapt with capitalism to correct it. This correction, nevertheless, is not an attempt to end capitalism, but instead to create a better capitalism (reformed capitalism). The tip of this conception is a welfare state model, where the labour class and capitalist class is assumed capable of working together. Dawam proposes the term ‘religious socialism’ to Islamic political economy, whilst assuming the achievement of socialism through the improvement of capitalism system, instead of social revolution or class struggle. This political economy conception is too classical in observing the contemporary dynamics of capitalism implemented by countries which adopting welfare state, with their capital expansion mobility parallel to political expansion (imperialist war). The inability of this conception to adopt the contemporary capitalism has made this Islamic political economy proposed by these people seemed nostalgic, if not obsolete. To witness this Islamic economy conception proposed by, for example, Dawam Rahardjo, who did not confront a fundamental critique toward capitalism, we can say that this Islamic political economy in none other that ‘Islamic bourgeois ethic”. This ethic has reduced political economy in ideal-moral This ethic is obviously the core of today’s Islamic-mask capitalism. Islamic political economy is entirely perceived as in harmony with capitalism. This is the face of political economy liberalism of Islam. The three above problems have shown that today’s Islamic political economy is not a political economy for the interest of the oppressed and marginalised class. These political economy conceptions benefit more the relatively established social classes, where they need a ready-package Islamic teaching as a guide to ‘cleanse’ their private properties, thus providing ‘syar’i’ (Islamic jurisprudence approval) guarantee toward their economic behaviour. In order for Islam to be capable of defending the interest of the oppressed and marginalised class, segment or group, we need a materialist act of Islam. An act of Islam based on the critique against the existing political economy, concurrently establishing a new political economy that grasp the materialist basis of Islamic economy teachings. What is a materialist act of Islam? It is the one that departs from the concrete social conditions, moved by discrepancy, gap, and contradiction between ‘what is must’ and ‘what is present’, sensitive toward shift and change of material facts surrounded those social conditions, encourage to revolutionary change those social conditions by extracting sources from Islamic teachings. Each act of Islam is primarily idealist, until the time comes to a materialist reversal. Its due to each act of Islam derives from the refraction of ideal-moral reflected from Islamic teachings. To stop at the ideal-moral is for one to be a fully idealist. We can say that the entire Islamic thought is idealist in nature, and thus problematic, until it reverse from the concrete, material and actual social conditions of the Muslim life it tries to address. The struggle of Progressive Islam in the future is a struggle to deepen the materialist act of Islam praxis. This is not an easy struggle, so we must continue to critique the Islamic liberalism political economy and neo-classical political economy which shrouded underneath it. A materialist reading of al-Quran and Sunnah (the recorded acts and words of Prophet Muhammad) is needed, as well as the legacy of Islamic thought (turats), Islamic history and the social history of Muslims. These series of reading is yet to be seriously done among Muslims, thus waiting to be done. This theoretical duty is align with the practical duty to actualise messages of liberation in Islam through social, political and economic movement: to repudiate Islam from the crime and mischief (al-fahsya’ wa al-munkar) of actual capitalism that perpetuate arbitrary oppression (al-baghy) on the face of the earth. Ulil Abshar-Abdalla, “Nabi Muhammad dan Intervensi Pasar” (‘Prophet Muhammad and Market Intervention”), islamlib.com, 11/08/2015. This article is an explicit statement from many other articles in islamlib.com that unsystematically and patchily portraying the defence of liberal Muslims toward capitalism. in political issues, their defence toward the interest of capitalist is shown by the response of these people (among others Luthfi Assyaukanie and Guntur Romli) on issues of forced eviction against the poor in Jakarta, and others in ‘social media’. “Economic freedom” meaning the widening market, not the freedom to savour economic yields. This last freedom is worsened under the spreading gap. “Baznas: Kendalikan Kesenjangan Turunkan Rasio Gini” (‘Baznas: Control the Gap, Decreasing Gini Ratio’, republika.co.id, 10 Mei 2016. Rifki Ismal report, ‘The Indonesian Islamic Banking’, 2011; cited in M. Dawam Rahardjo, Arsitektur Ekonomi Islam, Mizan 2015, h. 54. Note from translator: Yusuf Ali in its English interpretation of al-Quran translated ‘al-fahsyai waalmunkari’ (al-Ankaboot verse 45) as “shameful and unjust deeds”, and the author (Fayyadl) refers it to ‘kejahatan’ and ‘munkar’ in Indonesian – directly from Arabic. In line with this article’s arguments, I translated ‘kejahatan’ as ‘crime’ and ‘munkar’ as ‘mischief’ to emphasize the capitalism context. In Shafwat al-Tafasir, Syekh ‘Ali al-Shabuni comments on al-Quran al-Nahl verse 90, defines these three terms in an interesting manner. Al-fahsya’, crime, is perceived as “a finite malignance” (incapable of being infinite and can be put to an end), al-munkar, mischief, as “something the nature of humanity denies” and al-baghy, arbitrary, as a “tyranny and violation of truth and justice”. These traits can be found in capitalism: capitalism is a crime, mischief, and arbitrary. Crisis of capitalism has shown that it cannot be sustain and thus can end or collapse; within its exploitative nature, the system turns its back on the humanity instinct of equality and economic justice, and the system is not ashamed to use repressive means and abuse to protect the interest of the capitalists. Its systemic form made capitalism difficult to identify with the three concepts in a way that we often witness its sporadic expression.